Legal Aid’s office space has received a wonderful makeover. 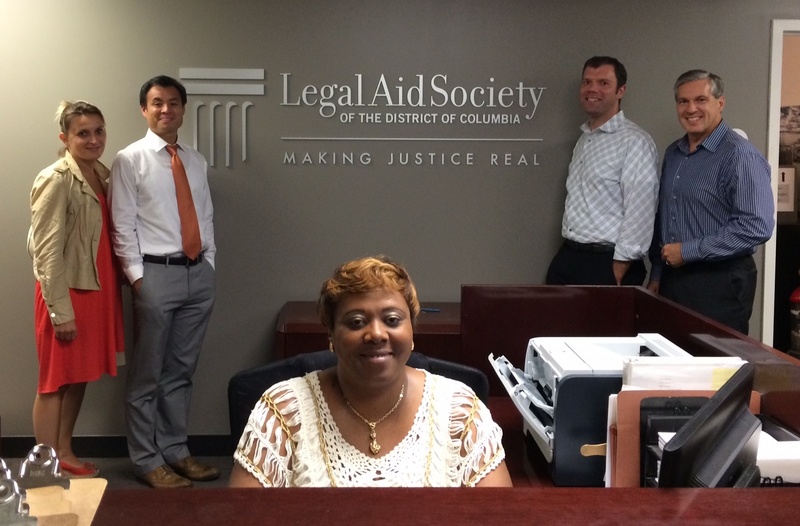 In July of this year, Legal Aid expanded to occupy the entirety of both the 3rd and 4th floors of 1331 H Street, NW. With the help of many, Legal Aid now has the much needed space to accommodate additional program staff so that we may continue to grow our program efforts. (L to R) Elena Fiammengo (Gensler), Chinh Le (Legal Aid’s Legal Director), Pat Roulhac (Legal Aid’s Receptionist), Matt Rowan (Gensler), and Steve Martin (Gensler). Upgrades to our space could not have been completed without the contributions and assistance from some amazing individuals and companies. First, we must thank our architect, Steve Martin (Principal) of Gensler and his amazing team, including Elena Fiammengo, Matt Rowan and Katherine Velasquez. Not only did they provide us with high-end, pro-bono architectural services, they reached out to their colleagues to encourage others to provide services pro bono or at significantly reduced costs. That alone was amazing, but they went one step further when they decided that the elevator lobby and the reception area should also be painted — something that was not in the original scope. Our wonderful interns will no longer be overheated as this project included improving the airflow in their space. WSP Group – MEP Engineering assisted with mechanical drawings and made every effort to ensure that the numerous box fans could be retired from this space. Larry Bean (Principal), Nicole Oliveira (Mechanical Engineer) and Adam Wolfe (Electrical Engineer) — thank you for your contributions! Space was further enhanced with the contributions of Al Minite of Alks and Associates and Jim Cody of Bloomsburg Carpet. Both companies worked to ensure that we had new carpet and flooring in not only our newly expanded space, but the entire common area and elevator lobby on our 3rd floor. Not be outdone, Catherine Pelletier of Knoll Filzfelt provided a wonderful pop of color in our overflow workspace. Not only does the Filzfelt provide color, it also provides some soundproofing in that area. Finally, and far from least, our continued appreciation goes out to Joe Alvarez of National Office Systems for helping us move furniture donations to our location. He and his staff make getting our donated furniture to our offices such a smooth transition and for that we are grateful. 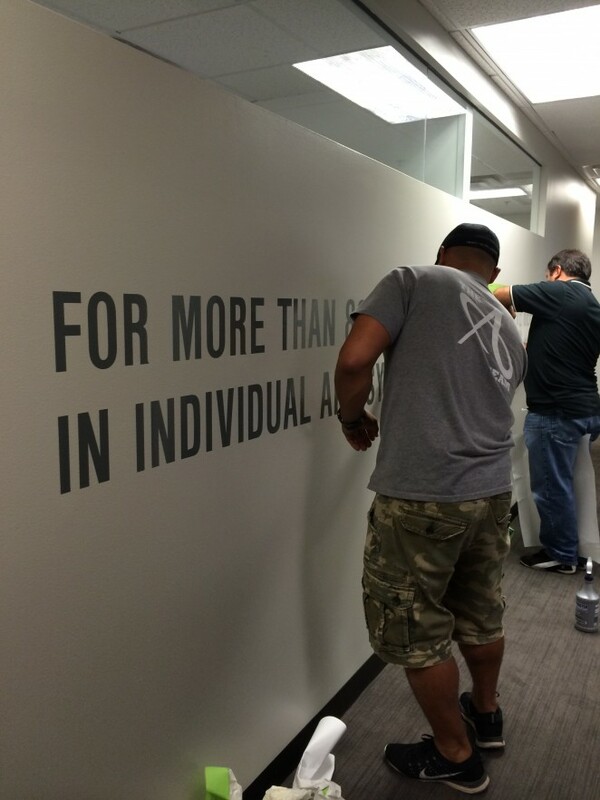 In addition to our staff, we find that our clients and applicants are very appreciative of this makeover as well. While we may look a little different now, our mission remains the same and stronger than ever, making justice real – in individual and systemic ways for persons living in poverty in the District of Columbia.